SPRINGFIELD, Mass. – Governor’s Councilor, Robert L. Jubinville, today announced his endorsement of Mary E. Hurley, Candidate for Governor’s Council in the 8th District. 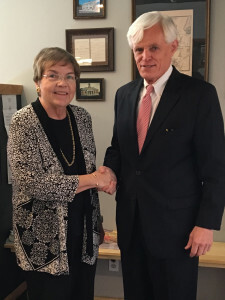 “I have followed Judge Hurley’s career for many years, I have been in Judge Hurley’s courtroom on numerous occasions and I am proud to announce my endorsement for Governor’s Council,” said Jubinville. “Given my experience on the Governor’s Council I know that she will be a great fit. In my view it is essential that Governor’s Councilors have experience in the courtroom Mary has more than 19 years of experience on the bench and experience in both criminal, civil and family law. Being a judge, Mary has interacted with hundreds of judges and knows what qualities makes a good judge and make someone unqualified for a judgeship. Her reputation as a judge in the District Court was that she was fair, considerate and just in her rulings and dealings with people who came before her both as defendants and victims. Jubinville, born and raised in Holyoke, represents the 2nd Governor’s Council District. Notably, he has more than 40 years of trial court experience and has logged more than twelve thousand appearances before judges and clerk magistrates. The 8th Governor’s Council District includes, Hampden, Hampshire, Franklin and Berkshire Counties. For more information on Mary Hurley and her bid for Governor’s Council, please visit electmaryhurley.com.